Announcement Welcome to All Little Rockstars. Personalized, Colorful and Simple Wood Designs For the Little Rockstars that Melt your Heart and Drive you crazy simultaneously. We, at Little Rockstars, we are passionate about family. We believe that a happy and playful childhood is a base to a happy life. Our products reflect playfulness, colors, and much respect. We have respect for every person, no matter how small, we appreciate his individuality. We have great respect for nature, and we want to make as little impact as we can. That is why our products are made from the most eco-friendly materials possible for the best combination of vibrant colors, long-lasting quality and low impact on the earth. I am happy to announce that, from the beginning of 2017, more than 80% of our colors are now 100% water based and Nature-friendly and perfect for toys, safe even for food contact. Moreover, we use cardboard, tissue paper, and brown paper to pack our items, all biodegradable materials to package our items but still be safe. I will be happy to make something beautiful and original for the most precious person in your life. Welcome to All Little Rockstars. 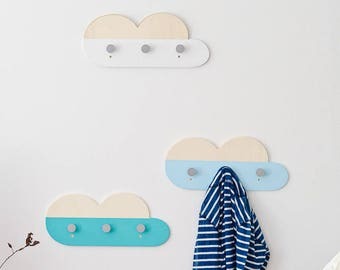 Love this coat hanger!! The perfect style for my daughter’s rainbow themed room! The whale is gorgeous and shipped just outside the estimated timeframe. One of the letters had unfortunately come unstuck - so we needed to glue it back on before we could gift it. Wonderful items. Ship on time. Excellent package. More than expected. I am in love in this color pallete. I put a lot of patience, love and time into making of my handmade items. All for your perfect satisfaction. Me and my boys, my everyday inspiration. Enthusiastic explorer of life. That's me. Mother of three little Rockstars that bring so much joy and, be realistic :), chaos in my life. Mother, runner, and a wife to my best friend. My life is constantly driven by the passion for creativity which hopefully never stops. My brain is alway working hard, never lets me sleep peacefully at night. My shop was a hobby for a long time. This year I decided to make a change and am working hard, to be able to work from home in my little business. In every item that I make, I give a lot of attention and love. And will always give my all to meet and to exceed your expectations towards me. May that be in the quality of my products as in quality of my customer services. Creativity was always a passion for me, but with my children I gave my creativity more meaning. Creating something new and beautiful is a source of power and happiness for me, and it is something that I always want to have in my life. If I can make someone else happy along the way, I will be the happiest person on earth. That is why I will always go above and beyond to make something unique and beautiful for your little Rockstars. Thank you for supporting me with your taking the time to read this. Thank you for browsing through my shop, liking what I do ands especialy with your purchases, constructive feedbacks, and honest reviews. 39 year old mother of three boys, loving life, in search for new challanges, fell in love in the smell of wood. Runner, ultrarunner, blogger, amateur photograper, who never takes the time to make better photos for my shop. Owner and little helper mostly at packaging and shipping master. Loving dad and best husband ever. CNC wood cutting the shapes that I created. Nicolas helps me with woodworking. I currently don't own CNC and Laser machine and he cuts my shapes out of plywood for me.. I do all the rest from the design to painting, sanding and all the rest that comes with this. Your privacy is very important to us, that is why, all the information you provided us with, will be used only for the purpose of the communicating with you regarding the specific purchase you have made or question that you have asked us and for the shipping purposes. We will not show, or give your personal information to a third party. Your privacy is very important to us, that is why, all the information you provided us with, will be used only for the purpose of the communicating with you regarding the specific purchase you have made or question that you have asked us and for the shipping purposes. We will not show, or give your personal information to a third party. Almost all my items are Customizable and can be Personalized. I love customer service and will be pleased to help you customize your items. So please just contact me in you have any questions, doubts or you don't know how to order. I will get back to you as soon as possible, but no later than in 24 hours time. I send all my international packages by Airmail with Tracking and Insurance. I ship it via Slovenian Post so your National Post will be making the delivery to you. After I ship your item I will notify you about it and send you a Tracking Number. Since I live in a tiny country shipping is fast. One day the package is here, the next is already out of the country. Domestic packages are usually delivered the next business day. EU packages are delivered in 3 to 5 days. And packages overseas are supposed to be delivered in 10 to 12 day. I have shipped to US, Canada, Japan, Asia and Australia and it always was delivered on time. In case you don't receive your item in expected time, please let me know so make inquiries. Turn around time is the time I need to make your items FROM THE TIME YOU ORDERED IT - TO THE TIME I SHIP IT. It is by no means the date in wich you should receive your order. The usual turn around time 3 to 5 business days. If you know exactly what you want, and you clearly state that when placing an order it can be shorter. If we have a lot of customization to do, trying different combinations, it can be longer, but I will try to recognize this and let you know about it. If you are in a hurry, please let me know about it ASAP. If I am out of town, vacationing, having medical problems or can't handle all the work, I change my turn around time to longer. I will always state that (at least) in my Shop Updates. If you find it hard to imagine how it will look when it is finished, don't worry, I will let you be a part of the design process as I will communicate with you, send you photos and different options to create a unique and original sign. If we will be unable to make something that you like I will make a complete refund on your order. *We can combine all the colors with all shapes available in my shop, or we can CREATE UNIQUE color combinations just for you. In this case, choose »custom color« or contact me before the purchase. NAME or WORD you wish to have on your sign. If your item arrives in a damaged condition, please contact me within three business days. Upon receiving of photographs, a refund or replacement will be issued for the damaged item(s), per agreement. If you are unhappy with your order, please contact me within three business days so that we may discuss a resolution. Refunds are not given on personalized or custom orders. I always send multiple photos before sending so that you know exactly what you will get. If your item is lost or the tracking has not updated, please contact me so that I can assist with file a claim. If your item is marked as delivered, but you have not received it, you will need to work with your local USPS to locate your package. All sizes are listed in the listing description in centimetres and in inches. If you find it hard to imagine how big it really is, let me know and I will post a picture next to something you can refer to. All my items are packed in a white box and decorated and later wrapped in a brown protective paper. If you want your item to be gift wrapped, you can choose "SHIPPING UPGRADE" while placing an order. I will wrap it in gray wrapping paper with white polka dots and pink or blue ribbon for boys and pink for girls. I will communicate this with you if needed. The gift will then still be wrapped in brown paper for protection. We have great respect for nature, and we want to make as little impact as we can. That is why our products are made from the most eco-friendly materials possible for the best combination of vibrant colors, long lasting quality and low impact on the earth. I am happy to announce that, from the beginning of 2017, more than 90% of our colors used are now 100% water based acrylic, Nature-friendly and perfect for toys, safe even for food contact. I will send you a video tutorial on how to mount the tiles. Each wall hook attaches individually to the wall. The tiles with hooks I supply you with UNIVERSAL hardware that is suitable for hard wall drywall and wood. The screws heads are painted in the colors of hexagons for the most invisible finish. Decorative (blank tiles) come with a small patch of double-sided adhesive tape on the back that is easy to remove from the wall after use. The hooks can be mounted by a strong double-sided mounting tape. This way no holes need to be drilled into the wall but the hook will not be as strong as if it was mounted with a screw.